The films of Michael Powell and Emeric Pressburger have always been strangely overlooked in the United States. If it weren't for Martin Scorsese's championing of films like The Red Shoes, it's unlikely they would be as well known as they are, but since they are British films rather than Hollywood productions, you don't often hear them mentioned alongside contemporary Hollywood hits like Casablanca, Gone with the Wind, and The Wizard of Oz. Yet Powell and Pressburger, collectively known as The Archers, were making films that were every bit the equal of those Hollywood classics, infusing classical storytelling techniques with wartime angst and lush Technicolor cinematography. A Matter of Life and Death was made in 1946, just after the end of WWII and at the heigh of the Archer's creative run that also included The Life and Death of Colonel Blimp (1943), A Canterbury Tale (1944), I Know Where I'm Going (1945), Black Narcissus (1947) and The Red Shoes (1948). After the wartime, morale-boosting successes of Colonel Blimp, A Canterbury Tale, and I Know Where I'm Going, The British Ministry of Information approached Powell and Pressburger, requesting they make a film that celebrated the "special relationship" between the United States and the United Kingdom. The result was A Matter of Life and Death (also known as Stairway to Heaven for its American release), a film designed to improve relations with the US during the postwar period. 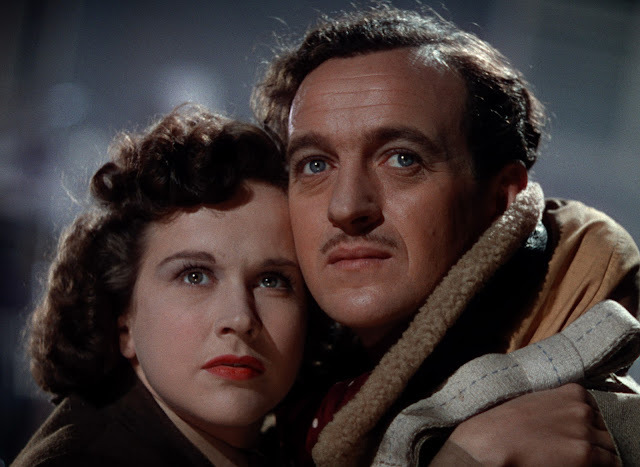 At its core is a love story between a Peter (David Niven), a British pilot who has been shot down over enemy territory, and June (Kim Hunter), an American dispatcher who hears his final words over the radio. Peter, however, does not die; instead he miraculously lands in the ocean and washes up on the British shores. Once home, he seeks June out, and the two fall madly in love, sharing a deep connection borne from Peter's near-death experience. There is only one problem - he actually was supposed to die that night, but due to a Heavenly error, he was accidentally left on Earth. When his "conductor" (Marius Goring) returns for his soul, Peter refuses, saying that while he was ready to die during the war, circumstances have changed due to his newfound relationship with June, and he wishes to remain alive. He files an appeal with the Heavenly court in order to grant himself an extension to continue his newfound love with June with a new lease on life. Powell and Pressburger never explicitly tell us whether the climactic trial is real or a product of Peter's mind resulting from a traumatic brain injury following his near-death experience. While the word is never said out loud, his symptoms are that of epilepsy, leaving room for doubt as to the veracity of what we're seeing on screen. That's part of the magic of A Matter of Life and Death, no matter what you choose to believe, it's still a beautiful tale of the perseverance of love in the face of death. The Archers chose to shoot Heaven in stark black and white, while the scenes on earth are in glorious Technicolor. Powell later explained this was to subvert audience expectations, but it also gives Peter and June something beautiful enough that they would want to resist Heaven to stay behind. And what breathtaking Technicolor it is. This film marked legendary cinematographer Jack Cardiff's first solo effort, and he masterfully transitions between the color and black & white sequences using some truly jaw-dropping fades that would be difficult to pull off now without the aid of computer effects. The film even makes tongue-in-cheek mention of it, as the angelic Conductor 71 laments that "one is starved for Technicolor up there." And it's easy to see why - every shot of this thing is a marvel, achieving such a vibrant depth of color that it almost makes modern cinema seem drab in comparison. Cardiff's mastery was apparent right out of the gate, and the range of color in the new 4K restoration on the Criterion Blu-Ray is simply breathtaking. Yet what makes A Matter of Life and Death so resonant now is that trial sequence, in which an American prosecutor (Raymond Massey), still upset about being shot down by a British soldier during the American Revolution, spars with Peter's defense attorney (Roger Livesey) over Peter's fate on Earth. This is where the special relationship comes into sharp focus, as the prosecutor seeks to dismiss the British character, and the defense seeks to strengthen its bond with the Americans. It is here that, when confronted with a jury made up of representatives from British colonies, that the defense demand a jury of Americans. When they arrive, each and every one is an immigrant - black, Asian, Native American, Italian, Indian, representing an American melting pot in a way that is surprisingly diverse for 1946, but is especially moving today. 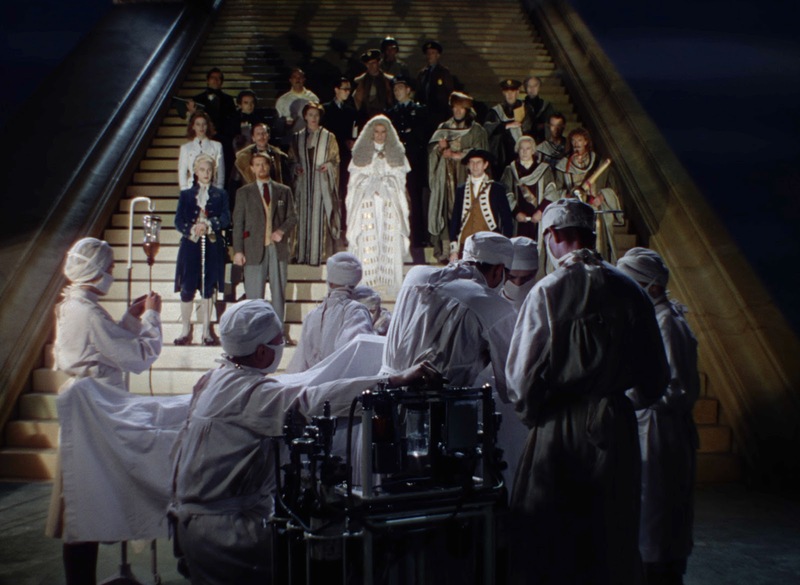 Powell and Pressburger had a special affinity for America, and their tribute to its ideals in A Matter of Life and Death mark some of their most deeply meaningful work. Whether it is a supernatural romance, or a metaphor for a man clinging to life after a traumatic injury, A Matter of Life and Death is a remarkable, magical realist fable, one in which the "love at first sight" catalyst never feels hokey or contrived. The films of The Archers often feel like the Golden Age of Hollywood at its peak, yet somehow better, more connected with their characters, and more emotionally grounded. Powell and Pressburger created magic with shadows and light, and in A Matter of Life and Death, they created a love story for the ages, that not only reinforced the strength of the special relationship between England and America, but in the American ideal itself. It may be a cliché to say at this point, but they really don't make them like this anymore. 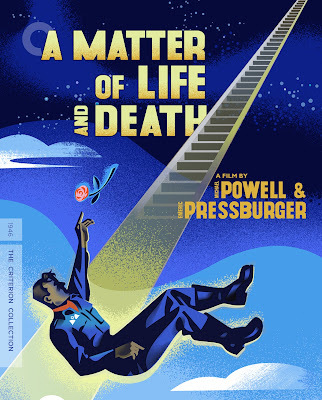 A MATTER OF LIFE AND DEATH | Directed by Michael Powell & Emeric Pressburger | Stars David Niven, Roger Livesey, Raymond Massey, Kim Hunter, Marius Goring, Kathleen Byron, Richard Attenborough | Not Rated | Now available on Blu-Ray and DVD from The Criterion Collection.